Aspen’s SH-Series (Super Haul Series) steerable dual lane hydraulic suspension transporters are designed for crane loaded payloads which primarily serve the super haul industry and are for on road applications. 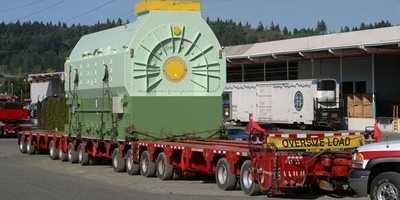 Configurations vary from payloads of 75 tons through 180 ton capacities, with axle configurations ranging from 9 through 20 axles (including truck axles) unless the transporters are in a wagon configuration. Aspen SH-Series trailers feature step deck extendable, high frame, bunk loading or platform configurations in both wagon style (tractors push/pull via drawbar) and non-wagon style (tractor supports payload via gooseneck) configurations. 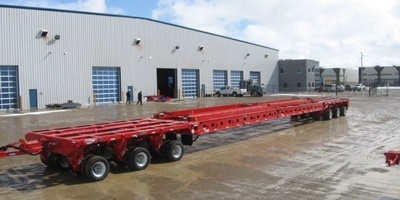 The SH-Series trailers have hydraulic 4 wheels across per line, hydraulic 8 wheels across per line, and dual lane hydraulic 8 wheels across per line. Transporter equalization is achieved by common hydraulic fluid in 3-point or 4-point configuration. This category includes 24-wheel hydraulic platform modules and our patented dual lane hydraulic units “MDLT”. Aspen’s SH-Series of trailers are available in specific regional interstate configurations (US and Canada) to maximize trailer configurations for specific regional regulations. The Aspen SH-Series trailers have single and dual lane hydraulic suspensions that use industry standard 3-point or 4-point configurations that are sourced in North America for less expensive and easily sourced replacement parts. This allows you to buy fully functional, less expensive trailers that are easier and less expensive to maintain for more payloads at cheaper operating costs. Aspen’s full range of super haul hydraulic product units allows you to pick the right equipment for the opportunities that make sense for your operation and abilities. 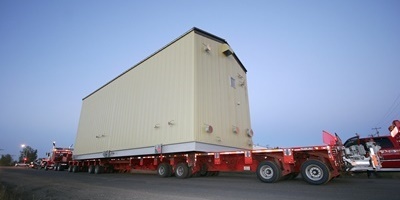 No matter what the hauling challenge you can be assured that Aspen has the right design for your specific needs. Aspen’s super haul products can be customized to meet your exacting requirements with customization of those critical issues that need that personal touch or customization.